The liberation from the strict confines of realism, the celebration of imagination, of fairytales, of the monsters under your bed and in your closet, the indulgence in beauty and fantasy, the triumphant declaration that humankind is more than rules and logic: that is Usher II. A scheme set in motion to achieve all of that, played out in the very last gothic manor built to honor Poe, a vengeance most dreadfully delightful. Usher II dress and mask were created for A Tattered Page, for its round focusing on The Martian Chronicles by Ray Bradbury. If this wasn’t the kind of offering you were expecting from a book set on Mars, read on. The Martian Chronicles is a series of stories, tied together by a central arc. One of them, entitled Usher II, is a story of dark and gothic revenge against those who would seek to rid the world of all things less than cheerful. We hope you enjoy the dark masquerade, and the reminder that the dark ones are everywhere. Even on Mars. The mask is unrigged mesh for easy resizing and positioning and it has a holding animation. 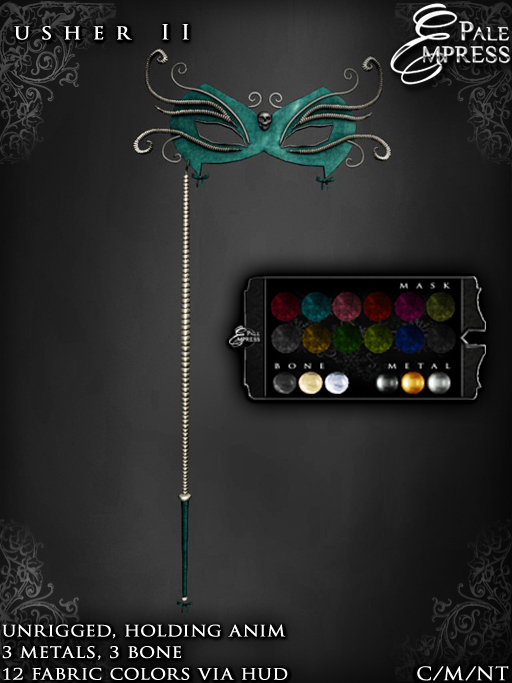 Both the dress and the mask have a colour-change HUD that has three colours for both metals and bone and twelve fabric colours for the dress and mask. The items will appear no-mod in inventory because of the scripts involved, but they are still modifiable. Permissions are M/C/NT. The dress L395, mask L195.